Sometimes things get ripped but luckily there is tape to fix it. Remember your favorite t-shirt? And remember when it became a cleaning cloth? That can be a thing of the past as we found you your new favorite t-shirt witch will always be perfect. The t-shirt is available in a men and women’s version in a whole bunch of colors and size ranging from Small – 6XL. But what makes this t-shirt your next favorite one is that it never looks bad not even if you put tape on it to fix some holes. 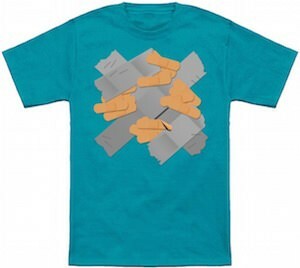 And the reason is they already printed duck tape and bandages on the shirt so people will expect that from the shirt but when it rips then just fix it and nobody will notice. Come get the last t-shirt you even have to buy, come get your As Good As New T-Shirt.